A major shift is happening in Utah Valley. Provo is breaking out of its conventional mold. Culture, art and music are spewing from the guts of this traditionally Zoobie-centric town. On Sept. 26 and 27 the Sego Festival will bring some 60 Utah bands, with an additional 50 sculptors, painters and video artists together in downtown Provo. 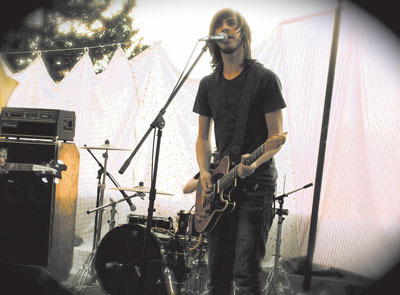 This is expected to be the largest locally sponsored music and art events in the state of Utah. Expecting roughly 7,000 attendees in two days, the Sego Festival kicks off at 7 p.m. to midnight Friday night (1st N and 1st W in Provo) and continues at 12 p.m. to midnight Saturday (the Castle Theater in the State Mental Hospital). For an event that is only in its third year, it has drastically changed the scene and perception of culture in Happy Valley. Since last September, More than 100 volunteers have gathered to work out the logistics of putting on such a massive event. From executive director to stagehand, there are two things that drive all this goodwill—the love of great local music and the pride of Utah County. In the vacuum created by the constant coming and going of BYU and UVU students, a movement has developed to bring to Provo what everyone else is leaving Provo to get—exciting music and culture. Maht Paulos, Sego Festival founder, is a man with big ideas. He and wife Liz Lightfoot could be any hip couple in Williamsburg, Brooklyn running their own boutique, touring with a band or creating art. Instead, they have chosen to invest in Provo—committed to staying in their hometown. Together, they hope to build what is glaringly absent––alternative culture. Now in their mid-20s, Paulos and Lightfoot are looking to create that experience. In December of 2007, Paulos and Lightfoot opened Coal Umbrella (with the help of local artists Jessie and Trevor Huish), a boutique with vintage and modified clothing, vinyl and trinkets. It doubles as a gallery for local artists and is a participant of Provo’s monthly gallery stroll. Paulos credits the fruition of Coal Umbrella to the ballsy way artists Ryan and Becky Neely opened Mode Boutique in Provo in 2006. The couple met while on a trip to New York with their art class at Utah Valley University (then UVSC). With savvy business sense, a killer aesthetic and incredible talent, the couple saw potential in Provo. Since then, their business example has inspired others to follow Mode’s lead. Mode began exhibiting local artists in December 2007 and have shown nine consecutive shows since. Between running Mode and working as a director of Provo Gallery Stroll, Becky was surprised that she found the time to produce work for the first show at the Sego Art Center (located at169 N. University Ave). The gallery is a permanent fixture for the Sego Art Foundation, with a full season of exhibitions. Garnering acclaim from many news organizations in Utah, the gallery is steadily growing under the Head Curator and Manager Jason Metcalf. What Fox has done (and continues to do) for Provo’s live music scene, Paulos hopes to do for the art community. 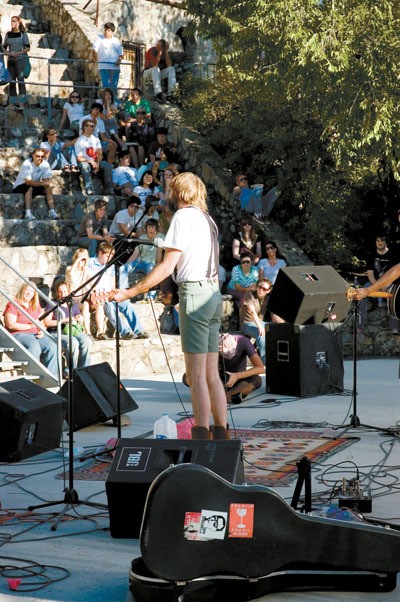 Using his desire to showcase Provo’s artistic and musical talent, Paulos and Matt Gifford put together the first Sego Festival in the summer of 2006. The keyword for the third annual Sego Festival is “cohesion.” As director of the festival, Amalia Smith is committed to making this an integrated art event. Planned as backdrops for the six music stages are five 12x6 canvases, each painted by a different local artist. Once night falls, video art created specifically for the event will be projected onto the stages and performers. Turrets and small rooms dot the grounds, each planned for a collaboration of art and music. For example, one room will be specifically designated for electronic/ noise/dance music. Signaling a huge advancement in the prominence of this year’s festival, artists and musicians had to apply and were selected by a jury. There will be 50 local vendors participating alongside booths of political and non-profit organizations. There are a number of invited participants including Salt Lake based art collective Project 337, headed by Adam Price. Graphic designers will display posters of the performing bands—each designed individually for them. Artists will make dioramas of their favorite bands to be placed at local businesses. Video artists will create 30-second footage that, as a unique art piece, will be a commercial for the festival and then screened at the event. Advertising will combine traditional posters with a guerilla art marketing campaign to increase visibility throughout the area.